A while ago, I had the opportunity to take eShakti's custom clothing website for a spin. 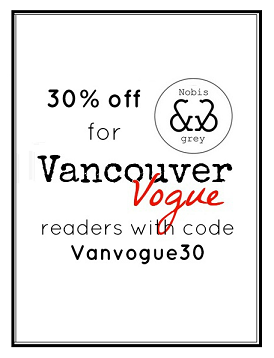 Not only can you personalize your dress from head to toe, but the dresses are all retro-inspired for the modern woman: a perfect fit for Vancouver Vogue! I do quite a bit of shopping online nowadays, but there are always those uncertainties with ordering clothes online. There's really nothing worse than total indecision when trying to pick the right size. "Am I really a 4? Will it run too small? Should I have ordered a 6?" And then there's those little tweaks you wish you could make... "I like it, but can't I just add pockets? Remove the sleeves? Lower the hemline?" eShakti literally solves all of those issues. Best online shopping experience ever? I think so. I decided on this adorable peter pan collared black dress, and punched in all my measurements, then had the option of choosing pockets (hell yes! ), to remove the sleeves (I don't like the look of those cap sleeves on my arms), and I decided to keep the hemline the same (just past the knees, perfect!). When it arrived in the mail and I slipped it on....needless to say, it fit like a glove! For the price, it's insane how cheap it is to order a custom dress!